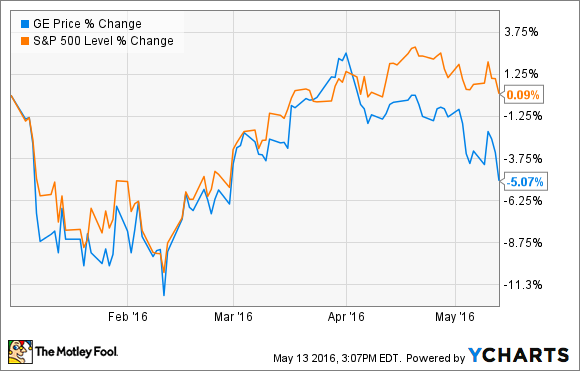 Can General Electric Company Hit Its Earnings Targets? Alongside industrial peers such as Emerson Electric, the industrial blue-chip stock has had its earnings outlook come into question. After outperforming a flat S&P 500 by nearly 24% last year, General Electric Company (NYSE:GE) has slightly underperformed the market in 2016. The story of GE refocusing its business (away from GE Capital) is largely known to the market now, so is General Electric's period of market-beating returns over? Let's take a look at what to expect in 2016 in light of the recent first-quarter results. As you can see above, the market reacted negatively to General Electric's first-quarter results given in April. And this is despite management reiterating its full-year 2016 guidance for operating earnings per share of $1.45 to $1.55 and cash flow from operations of $30 billion to $32 billion. The problem? A combination of ongoing weakness in its oil and gas segment -- in which the company has made significant investments in the last five years -- and a weak macro environment are calling into question GE's aim to hit $2 in industrial EPS by 2018. Indeed, other companies, such as Emerson Electric (NYSE:EMR), have reported weaker-than-expected capital spending by oil and gas customers. The question is: Does General Electric have enough growth drivers to offset oil and gas headwinds and moderating global growth, in order to hit its long-term earnings target? I happen to think it can. Spending in the power industry is trending favorably, and has moderate growth opportunities in future years. General Electric's execution with its new key products, such as its H-turbine in power and LEAP engine in aviation, continues to excel. Management is starting to turn around performance in healthcare, and sees growth opportunities through acquisitions. Aviation remains a strong point in the industrial sector and the company has heavy exposure. The Alstom acquisition continues to impress, and management has yet to outline any growth synergies from the integration -- suggesting possible upside in the future. On the recent earnings call, CEO Jeff Immelt outlined that aviation, healthcare, and power would see full-year results "better than what we showed in December." He's referring to the annual outlook meeting, so clearly the three segments are seeing better-than-expected trends in 2016. In a return to form, healthcare orders were up 5% organically in the first quarter, and the long-term aviation story is well known. Let's focus on power. POWER IS THE KEY TO GENERAL ELECTRIC'S FUTURE EARNINGS. IMAGE SOURCE: GENERAL ELECTRIC. The power story is a combination of a moderately positive end-market outlook and General Electric's market penetration with its new, more efficient H-class turbine. Reserve margins (a measure of how much additional resources networks need to meet demand) continue to fall, indicating growing pressure on utilities to spend in the coming years. In addition, Emerson Electric CEO David Farr gave a positive outlook on Emerson's latest earnings call. He said, "And so the spending is there for power and we're aggressively seeing that. We're doing extremely well in Europe. We're doing well in North America, and we're doing well in Asia." But here's the thing: General Electric doesn't just rely on end-market growth, because its new HA turbine is capturing market share in the heavy-duty H-class market. President of GE Power Joe Mastrangelo discussed the matter on the recent earnings call by noting, "In two years we've gone from single-digit to 40% share of the space." In fact, if growth from gas turbines (a core company product) plays out as expected, Immelt argued it will "lead us to an organic revenue for the company that's 5%, let's say, in the second half, and a range that's 2% to 4% for the year." Also, there appears to be some upside potential from the Alstom acquisition. At the time of the initial announcement, the deal was seen as a consolidation play in a mature industry, with cost synergy generation as the key focus. However, there is clearly an opportunity to sell General Electric's digital solutions into Alstom's installed base. In addition, General Electric can generate revenue synergies by selling Alstom's steam generators/turbines alongside its gas turbines to combined-cycle customers. Indeed, in discussing the deal, Immelt argued, "We didn't underwrite any revenue synergies at all, and I think that's going to be the icing on the cake as we go forward." Headwinds in oil and gas continue to wreak havoc on General Electric, but full-year guidance was maintained on the back of improving trends elsewhere. Aviation remains a strong point in the industrial economy, and its healthcare segment is growing orders again. However, investors should look toward power for future growth. The industrial economy isn't doing great, but General Electric remains well positioned and on track for $2 in industrial EPS by 2018.